This is a website we designed for the B.C. 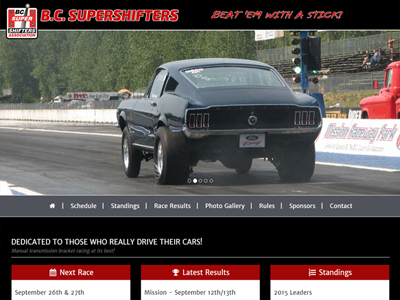 Supershifters, the largest group of manual transmission only drag racers in British Columbia, Canada. This is a mobile responsive website designed using the bootstrap framework. The home page features a slider with drag racing pictures, latest racing results and schedule, as well as a Google map and footer contact form.